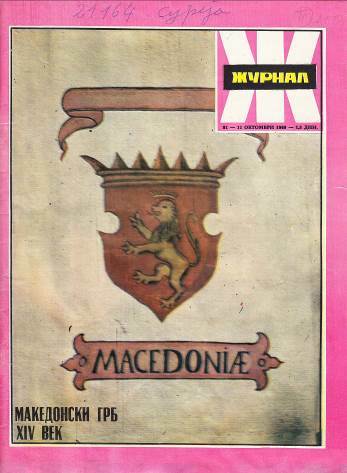 50 years ago, on October 11, 1968, in the magazine “Zhurnal”, a text was published in which the existence of the Land coats of Macedonia was publicly announced for the first time. The text titled “The Macedonian Coat of Arms of XIV Century” is not signed, but Aleksandar Matkovski believes that the author is Slavko Dimovski. The article details and photographs from the Fojnica Armorial are published. With this article the process of popularization of the Illyrian heraldry and the Land coat of Macedonia begins , which will be crowned with the book by Aleksandar Matkovski “The Coat of arms of Macedonia”. In the next few years, both Dimovski and Matkovski will publish articles and papers on the Land Arms, which will lead to a sort of dispute, which one first discovered the Land coat of Macedonia. Otherwise, the first one to write about the Land Arms is Stjepan Antolak, who in the university textbook “Auxiliary Historical Sciences” from 1966 will mention the existence of the Land’s Arms of Macedonia as a red lion on a golden field and vice versa, while not taking sides which of them is “the real” .